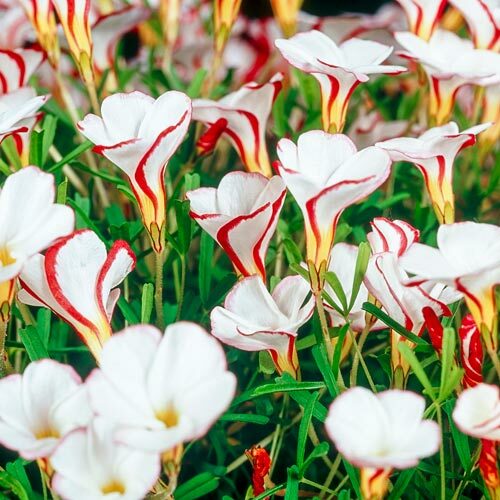 Candycane Oxalis | Gurney's Seed & Nursery Co. Thanks to its unusual shape and festive coloration, this oxalis variety is known as Candycane! Unique blooms of white are striped in bright red and surrounded by mounds of grasslike foliage in mid to late summer. This is an airy, delicate-looking 1-1½" flower that starts out as a helical cone shape and opens fully when it is warmed by the sun. Plus, each day the flower show starts again. The showy blooms of oxalis look amazing in sunny borders, rock gardens or decorative pots. They make a wonderful ground cover, too. Hardy in zones 7-9, so bring containers indoors to enjoy over the winter months in zones 3-6. Tolerant of many soil types and easy to grow. FoliageClover-like leaves, linear, slender and green. BloomsMid to late summer , 8-10 weeks from planting. PruningLate in the summer the leaves will yellow and die back as the plant slips into dormancy. Foliage many be removed at this point. Your oxalis will rest for a few months before beginning the next growing cycle. CommentsA most adaptable plant which forms lovely mounds of cloverlike leaves with 5 petaled flowers that open wide in the sun. Lovely swirled white flowers edged in raspberry red. Excellent for Alpine and rock gardens. Can be grown indoors. If you ordered the bulbs and live in a zone colder than zone 7, you will need to plant them indoors and treat them like a houseplant. These bulbs will not need chilling when planting indoors.